Monet considered him as his true master while Manet usually said that he was the modern landscapes’ father. Generally he was called the painter of Paris streets and Honfleur and his pupils were enchanted with his landscapes and daring style, which, in the 1860s already bore the beginnings of a soon-to-blossom art movement, Impressionism. His name was Johan Barthold Jongkind, a landscape painter from the Netherlands, who made France his base (since 1846) and where he was highly regarded by art lovers and the artistic community at that time. His works were considered highly important in Impressionism’s development despite that fact that he was born much earlier and his art education focused on traditional learning of Dutch landscape painting. Johan Barthold Jongkind was born in Lattrop, Netherlands in 1819. His father, a tax collector, was assigned to the region of the Vlaardingen harbor at the Meuse River area, where Jongkind spent his childhood. He left school in 1835 at the age of 16 to work at a notary’s office as a junior clerk. His mother allowed him to go to The Hague to take drawing classes at the Academy of Arts and later went to be a pupil at the workshop of Andréas Schelfhout, a Dutch Master in landscape painting around 1836. He continued to receive training from Schelfhout up to 1845. His studies during this period focused on the works of Dutch artists during the country’s Golden Century of Dutch art. One of the things instilled in him by Schelfhout was how to rapidly sketch when painting outdoors. 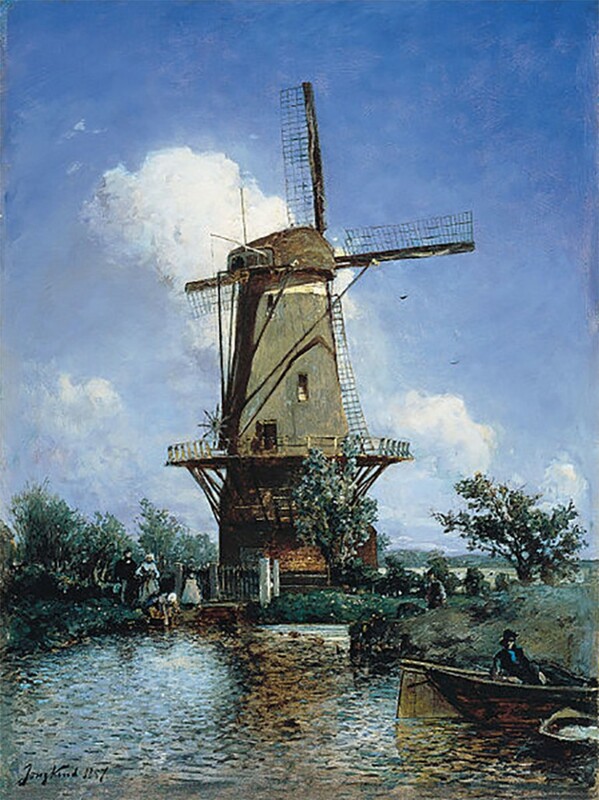 He painted classic themes from nature, such as winter scenes, windmills, canals, boats and harbors realistically, which was a continuation of the Dutch naturalist tradition. He was noticed by French Romantic school leader, Eugène Isabey in 1845, and was invited to be a student in the French artist’s studio in Paris. He was also recommended to the future Guillaume III, the Prince of Orange and was given an allowance and subsidies that continued until 1852, thus he was able to go to Paris. The artist had a novel way of painting, doing it outdoors and quickly doing watercolor sketches to immediately capture the moments’ impressions to which he probably added his comments to guide him as he composed a more constructed and elaborate painting. He also used a brighter palette and introduced in his paintings miniscule strokes of colors to show the light’s decomposition and show its various effects on a variety of objects. In 1850, he was able to join the Paris Salon and exhibited “View of Harfleur Port,” which received critical success. In 1855 Jongkind returned to Rotterdam after the death of his mother and went back to traditional Dutch paintings that he sent to Père Martin, his art dealer, to sell. 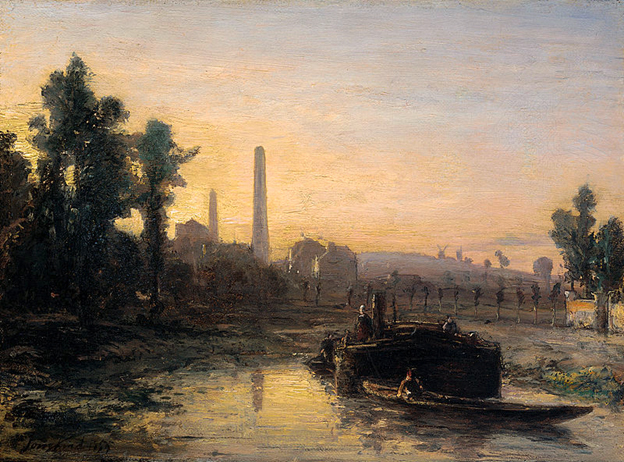 Friends, such as Père Martin and Adolphe-Félix Cals, through the initiative of Comte Doria, organized an auction sale of works by 88 artists, including Rousseau, Isabey and Corot to raise funds for Jongkind’s return to Paris in 1860. He met Monet and Boudin in 1862 and joined them in painting in Le Havre. Monet would later expressed this gratitude to Jongkind for the valuable art lessons he received from the artist. Jongkind would always visit the Norman Coast in the summer, where he painted landscapes that were more diverse and larger, with the subtle play of light becoming the main focus of his work. His landscapes featuring the Norman Coast became the forerunner of Impressionism. However, Johan Jongkind preferred to work in the background. While he was highly praised and influential to many artists, he did not like to be a leader, thus we was not well known as one of the early exponents of Impressionism.